There are three primary reasons why we find ourselves witnessing the tentative conception of a new political party. Firstly, both the Labour and Conservative parties find themselves dominated by political views which sit outside their traditional mainstream. Secondly, and crucially, in both parties those newly dominant political traditions have proved to be intolerant of the diverse viewpoints that have historically nested together. 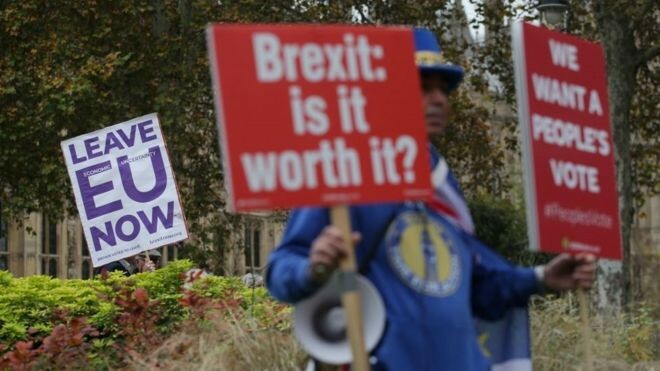 Thirdly, the particular pressures of Brexit has brought these differences to the boil — Brexit itself resting on top of realities and myths within our country that stretch back through deindustrialisation, the end of Empire, the second world war and beyond. The cumulative effect of this has been that the broad churches of the Labour and Conservative parties are beginning to crumble. Where this heads now is not so obvious. Our first past the post electoral system makes the adolescence of any new party incredibly difficult. As long as first past the post remains, if either Labour or the Tories manage to hold together their party they will dominate the House of Commons for years to come. However, unlike 1981, it looks possible that both parties might splinter — producing a fundamental reshaping last seen in British politics with the strange death of the Liberal Party in the run up to World War II. The first challenge the newly formed Independent Group will face is Brexit. Acres of column inches will be spilled on that — and their role within it — over the coming weeks. Whatever happens with Brexit what will remain once the frenzy is over is a country that is divided on any number of fronts. From immigration to climate change, wealth to age, education to geography, Britain is riven with divisions. On top of this, these dividing lines no longer even vaguely match those of the broad alliances within the two main parties — and our current political leaders have decided to amplify divisions they think benefit them, rather than trying to bridge the gaps. In a country with a fragile unwritten constitution that is extremely dangerous. We cannot go on like this. Whatever happens with Brexit we need to try to build our country afresh so that it works for everyone, and is a positive partner to the rest of the world. It is crucial that those now setting out to lead our country are able to be both on the dancefloor of Brexit and on balcony thinking now about what comes next. We must grow a new political culture based on debate and dialogue rather than division and abuse. We need to build communities that reach out, not foster tribes that push others away. First past the post — which naturally steers towards producing deep divides between its two biggest political parties — does not help with this. But what is happening now is well beyond that: it is the absence of deliberation, the abuse of those who don’t agree with your views, the demonisation of those that you feel are different from you. We must fix this if our country is to have a positive future. We must move power out of London and back into our great towns, cities and counties. Britain is, by any sensible measure, the most centralised developed country in the world. This leaves government feeling distant from ordinary people, makes our politics unresponsive and cold, hollows out our communities, and leave us feeling disempowered. It also lead to bad decision making. We must build again the great local governments that were so important in Britain in generations past, devolving decisions and money away from Westminster and Whitehall. We must be honest with people that there are many problems we face which have no easy answers. Across the world, jobs are moving to China and being lost to automation. Capital and companies are globally mobile and can outrun and outwit any nation alone. Climate change is already affecting our ways of life and radical changes will be needed if that is not going to get far, far worse. Here at home, whilst our taxation system has too many holes, cuts to out public services have gone far too far, and the financial services sector has failed to pay its penance for the crash it caused in 2008 we cannot suddenly banish the private sector we have and expect a new, better one — creating jobs and paying taxes — to immediately spring up in its place. When it comes to public ownership, while Britain’s sale of everything from water companies to school and hospital buildings has taken privatisation to extremes, if we are going to pay shareholders for the assets they own there is no easy, cost-less, way to take them back into collective ownership. But where there are easy answers we must take them — even if it involves some political pain. It should shame us as a country that we don’t build enough houses for everyone who lives here to have a decent home. We must fulfil our potential to be the world leader in renewable energy. The way vocational education works needs to be transformed. There is no sensible reason why there is such a poverty of ambition in our industrial strategy. We must understand that technology has fundamentally changed the world — and that means politics needs to change fundamentally too. This has already happened in so many ways, and will continue to accelerate over the coming decades. Most importantly for the practice of politics, it has changed the way that people interact with each other, with news and information, and with politics and politicians. The way politicians do politics and the way our political parties work has not changed with this. Political parties remain set up for the industrial rather than the digital age. The power of technology to connect with people in ways that were never previously possible is immense. Destructive actors have harnessed that to their advantage abetted by those who are willing to let them play to our basest instincts as long as they can make money. There is no fundamental reason why technology should be harnessed primarily for ill rather than good but that is what is happening right now. Political parties — and therefore politicians — needs to change fundamentally to live within this new reality. We must accept that the existential threat of climate change and environmental destruction needs to sit at the heart of our politics from here forward. We must do this both because it is the right thing to do — we should be stewards of our world rather than consumers of it — and also because it is increasingly obvious that the threats of global warning are not abstract but immediate and coming within our lifespans and those of our children. We must acknowledge that markets need to work for people, rather than people for markets. To bastardise Churchill, while its clear that a market economy is the worst economic system except for all the others, it is also clear that capitalism as it stands is broken and works in the interests of far too few people. If we do not fix that, eventually our country, and our world, will fall apart. We must build a country that recognises we need to ensure people have good jobs rather than any job. The changes that technology has brought to politics have also come to the workplace and that process is about to accelerate. We need to understand and be ready when artificial intelligence wipes out jobs across every sector of our economy — something that is already underway. I’m sure that they way I have expressed these ideas is imperfect. I am sure there are other ideas that should sit alongside or ahead of these. But I hope you agree these are things we should seek to pursue, that they go well beyond the agenda of any political movement in Britain right now, and that they are changes that we should be seeking to make to our politics and our country — and seeking to make right now.